For many people, the first unwanted signs of aging are in the face, neck and jowl region. There are some non-surgical options for these areas, such as lasers and Thermage. We do have a very versatile Sciton® laser, which we use to improve various skin issues: texture, pigmentation, fine lines, etc. 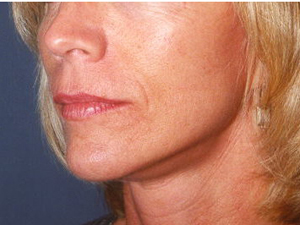 Thermage is probably the best non-surgical alternative for skin tightening, in my opinion, and the longest lasting. Its effects, however, are different than surgery’s more dramatic changes. Surgery is like having your dress or pants taken in a bit on the sides: skin is actually removed, and the muscles underneath are tightened. With Thermage or a laser treatment, the skin or fabric itself is improved or “re-sized,” sort of like putting that dress in the dryer or steaming it to re-size it; the skin or fabric actually tightens. After these office procedures you look pretty familiar. Many people can really benefit from both Thermage or laser as well as from surgery. There certainly is a lot of advertising these days on television for facial surgery, promising a lunchtime lift, in a little over an hour, out and about that night …you know the spiel. Well, Lifestyle Lift is a franchise that some doctors buy! And while it may be good for some, this is your face. You might want to take a look at the recent stories about Lifestyle’s illegal advertising. I do comparable facelifts, in the office and at prices that are comparable to these standardized lifts, for those who are good candidates. But the procedure takes three hours at least, and you go home in a big, bulky dressing for about 24 hours, so don’t plan on going out to dinner that night. Plan on sitting up in your recliner cozying up to a bunch of ice packs! I know, however, that the results will be long lasting and enduring. Each facial procedure I perform is customized to what is best for you, whether it is a MACS lift, an “S-lift”, or whatever. I have done them all. And if you are not a candidate for this, but for something else, I can advise you on that as well. 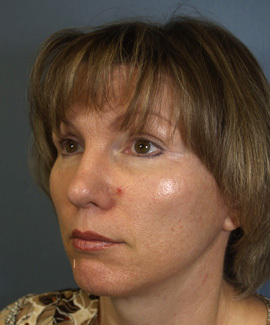 The thread lift was another type of mini-surgical option that was very popular recently. I never performed this procedure but was intrigued by the concept. The thread devices have now been recalled after problems developed. Still, facelift surgery remains the gold standard of facial rejuvenation. Its effects are proven, dramatic and long lasting. But surgery is surgery and has the attendant risks – risks of surgery, scars, recovery time, expense, pain. Sometimes, though, without surgery, your problems just will not get any better. It’s that “getting older” thing. People always ask, when should I consider surgery? My answer is, when it starts to bother you. When you become self conscious about looking down or hate seeing pictures or videos of yourself, it’s time to come in to at least talk about it. And I will tell you if I think you are silly. There are so many variations on facelift techniques: the quicklift, that lifestyle lift, mini-lifts, neck lifts, each promising safer surgery, with faster recovery and fewer complications than the next. Again, to be realistic none can be done over the lunch break and have you back at work by three. However, there have been some new and exciting, innovations. I believe very reliable results with relatively few complications can be achieved with some of these techniques. First, then, the mini-lift, lifestyle lift, quick lift and MACS–lift (minimal access cranial suspension) are all variations on a theme. Basically the surgical approach is in front of the ear, with very little dissection done behind the ear. The incision zig-zags in front of the hairline at the temples, and then down, sort of inside the ear, and then sweeps to the bottom of your ear. This can result in significant improvement for the cheeks and jowls, and does help the neck some. But you are really relying on an upward pull, to help lift the neck (or area under the chin) rather than dealing with any muscle laxity directly. 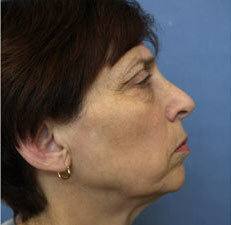 Usually some liposuction is added under the chin, to try to alleviate any hanging tissue. The major advantage of this technique is that it can typically be done under local anesthesia, so the costs of the hospital are avoided. There is not too much discomfort, and if no fat transfers are included, downtime is modest – usually a week to ten days. I see a lot of patients now who would rather have less surgery, more often, and this suits their time constraints nicely. It is a little tuck-up, but can really DO something. I have been having a lot of fun with these little lifts lately. You will see results! AND if you need the big lift later, no problem. Another lift can easily be done at a later date, when you really get saggy. 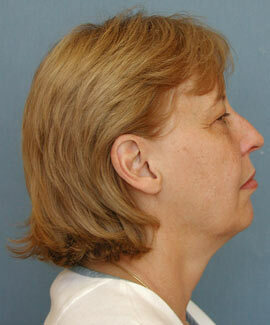 Second, and if you have a lot of skin under the chin, then a neck lift is really for you. Do an honest assessment under your chin, and if more than an inch of skin is hanging down, it’s time to deal with that neck! A lot of this is related to genetics and how you are programmed to age. (It’s your mother’s fault!) 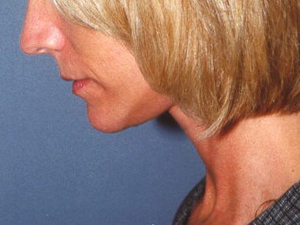 A necklift is usually combined with a facelift, but basically it adds surgery for the bottom of your face, and under the chin, along with the two sides of your face. In other words, this more extensive surgery involves your two cheeks, the chin, and the area behind your ears. This really addresses those loose muscles, the platysma muscles, that are like two three inch wide ribbons that hang from the sides of your mouth and cheek, and drape down onto your chest. 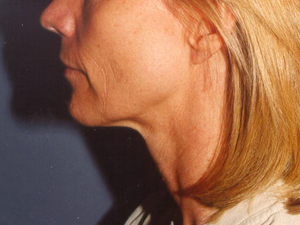 As we age, those two ribbons of platysma muscle lose their tightness, and start to hang. You can sometimes see the edges hang down below the chin, like a double swag. Tightening these muscles, and sometimes even sectioning a strip, to make them support your chin like a hammock, is probably the best way to really give a sharp angle to the neck. It is, without a doubt, a very long lasting correction, and I know you will enjoy the results for years! But it does require more downtime, more expense, and a bit more recovery. Finally, as additional advice, in order to have a jawline, you must have a strong jaw. Sometimes a “weak” profile ahead of time can mean you will be disappointed that you didn’t come out like Audrey Hepburn after a facelift. She had an amazing neckline to start with! All of the face procedures can be combined safely with other procedures – fat transfers, eyelid lifts, chemical peels, etc. And none of these procedures is a substitute for fillers. Even after facial surgery, fillers may be required to give you the look you want. Fillers are the final “frosting” to smooth out those stubborn wrinkles and achieve a smoother look. I hope this helps take some of the mystery out of facial rejuvenation surgery. Here are some examples of what surgery did for a few individuals. I have many more pictures at my office. Many working people have this surgery not necessarily to look younger, but just to look and feel better groomed, to have a neater, crisper looking jaw line. This young lady had an inherited a trait of a weak chin that just ran in her family. The “I have my father’s jaw line” and the “I know what I will look like if I don’t have surgery gene.” The after photo is take over 4 years after her surgery – but she has had some little things done in the office in the meantime (BOTOX and other injectables) to maintain her youthful look. This young lady just had set a timetable for herself. When she reached a certain age, she had decided she would have something done – both while she was still young enough to enjoy it and young enough that most people didn’t even notice she had something done. If you don’t like your neckline when you lean over, maybe you should consider surgery – sometimes without it, every day it looks worse. This lady just wanted a little freshening for a big family event. 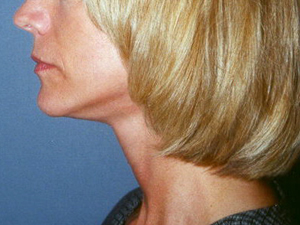 She had her face and neck rejuvenated along with some fat grafting. The volume that the fat provided really gives a nice refreshed look to her face without making it look too pulled. Her incisions are well concealed by her hair, but run along in front and in back of her ear, as well as a small incision under her chin. 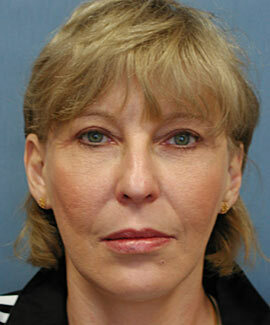 This woman had upper and lower eyelid surgery and her face and neck rejuvenated, along with fat transfers. She followed up with her aesthetician with some light peels as well. Again, the removal of the extra skin combined with the tightening of the muscles underneath and the restoration of volume, all work to provide her with a more relaxed look. I think her eyes just really sparkle! And they don’t look hollowed out or tired anymore. This lady feels like a kid; working, running around, busy, busy, busy. But suddenly, she looked down one night, and realized there was extra skin on her neck. She put her hands up to her face in the mirror and pulled up gently, and liked what she saw. She felt her face looked tired, not fresh any more. And remember – the more you have done, the longer the healing time, but also, the results may last longer, too. The take home message: if it can be done in an hour, and you are home for dinner, then the results probably will not be as long lasting. Make a commitment, get the results. She has a refreshed look that I know will last for years. Her facelift was done in the office with local anesthesia, much like going to the dentist’s office. The numbing medicine does sting, but once it’s numb you won’t feel anything! She spent the afternoon with use, and spent the night resting with her head up. Within a day or so, she was able to shower, wash her hair, and be out and about. It is at least a week before you are presentable with a little cover make-up!